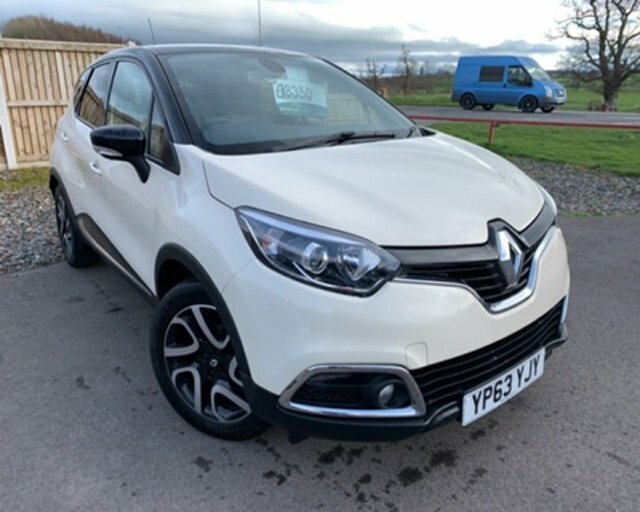 THIS RECENT ARRIVAL IN TO OUR STOCK IS A RENAULT CAPTUR DYNAMIQUE S 1.5 DCI MEDIANAV ENERGY 90 BHP 5-DOOR, FINISHED IN IVORY WITH BLACK ROOF & MIRROR CAPS WHICH IS COMPLIMENTED BY A BLACK/GREY CLOTH UPHOLSTERY. THERE HAVE ONLY BEEN TWO REGISTERED KEEPERS FROM NEW & IT COMES COMPLETE WITH AN EXCELLENT SERVICE HISTORY. DUE TO THE EXTREMELY LOW CO2 EMISSIONS, THE ROAD TAX IS NIL COST !!! STANDARD SPECIFICATION INCLUDES COLOUR SATELLITE NAVIGATION, BLUETOOTH CONNECTIVITY, 17 INCH 5-SPOKE ALLOY WHEELS, CRUISE CONTROL, REAR PARKING SENSORS, AIR CONDITIONING, ELECTRIC WINDOWS, ELECTRIC FOLDING MIRRORS & IT HAS TWO SETS OF REMOTE KEY FOBS. Save money on a used Renault car in Penrith by speaking to the team at Intercars of Penrith Ltd today. We're the area's leading supplier of quality pre-owned vehicles and we'll always go the extra mile to ensure our customers find the right model to suit their needs. Inject some fun into your daily commute with the help of a used Renault Clio, or turn to a Renault Grand Scenic if space and refinement are your two main concerns. You'll find our complete range of used Renault cars listed here on the website, but be sure to contact a member of the showroom team if you'd like more information. Booking a test drive is easy ? just contact us today.